This was actually Arthur early Friday Morning. Once the thunderstorm storm had got me up and the cats in, at about 5.30 in the morning, Arthur decided that the best thing to do would be to guard all the stuff on my desk, against lightening damage. This was before the doormats required supervision. Doormats do not need guarding this early in the morning. 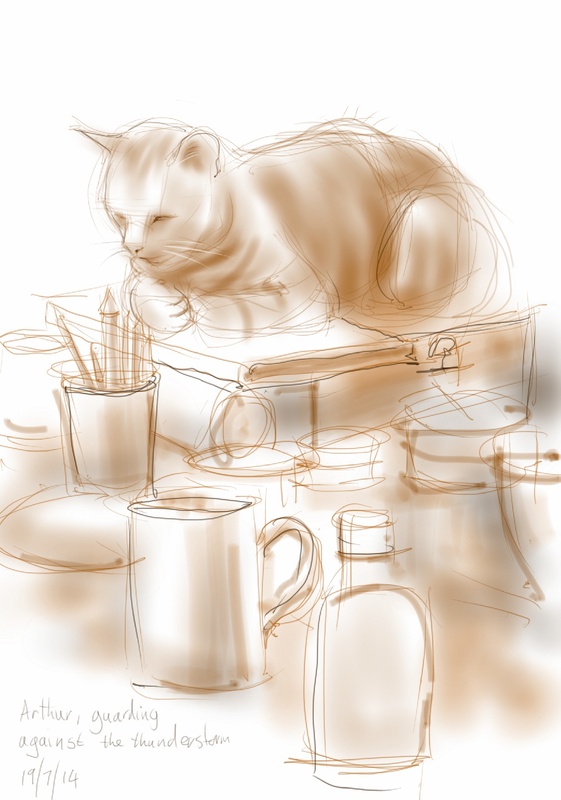 This entry was posted in Cats and tagged art, arthur cat, cat drawing, cat sleeping, cat-of-the-day, digital sketch, drawing, ginger cat, illustration, still life on July 22, 2014 by Nancy Farmer.